The total cash value of prizes is over $10,000 but the true value of winning at the Hollywood & Vine Film Festival is the marketing and promotion power. All winners will receive a festival laurel for the specific winning category which can be used for filmmakers' professional use in marketing his/her project via website, DVD box cover or other marketing materials. Other HVFF prizes include two 1-year memberships to BReaKiNG iNTo HoLLyWooD (valued at $600) and the BReaKiNG iNTo HoLLyWooD book. Certain categories of winners will receive other prizes as well. For example, best actress/actor award may receive a complimentary photography session or referral to an agency or management firm. 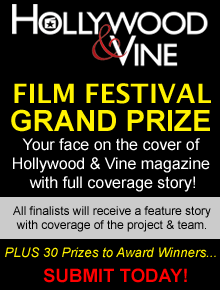 In addition, each festival award recipient will be featured in the winter issue of Hollywood & Vine, an entertainment trade publication that receives 102,000 clicks/month. The magazine is read throughout the U.S. and in over 10 countries. © Copyright 2012 and Beyond. HollywoodVineFilmFestival.com All Rights Reserved.